It has been 220 days since the last Heat Signature trailer, according to designer (and former PC Gamer writer) Tom Francis, and so here's a new one. Trailer is probably the wrong nomeclature, actually, because clocking in at just over 11 minutes, the video includes plenty of gameplay detail, with Francis providing running commentary throughout. Of note are the randomly generated galaxies (which are still very pretty), explanation of how factions work, and the dangers posed by an icy, infinite vacuum and the practical value of throwing wrenches in confined spaces. 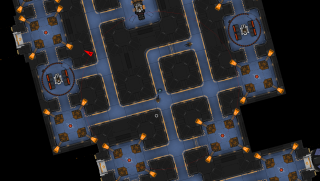 What I find especially appealing about Heat Signature is the randomness underlying the whole thing. Francis does pretty well as he plays, as you'd expect from the guy who's making the game, but he still manages to get himself into all kinds of scrapes. In fact, he put some of his more interesting moments together in a much shorter (and swearier) video of Heat Sig out-takes, saying "the game broke in about 20 different ways" while he was making the trailer. "The game now procedurally generates a huge galaxy of colourful nebulae, dotted with hundreds of space stations, linked by trade routes that carry supplies between all the outposts of each faction's empire," Francis explained. "Your take missions to intercept ships flying those routes—stealing cargo or assassinating VIPs to break the supply chain, leaving space stations isolated and ripe for capture." Heat Signature certainly seems to be coming along nicely, and Sam and Tim were suitably impressed by it when they took it for a spin in a March preview. Public testing hasn't begun yet, but you can sign up to be notified when it does at heatsig.com.